Timing is everything, and not just in music, but we are here for the music right. After a long process of songwriting and recording, founding the right members to fill in the ranks, issuing a few examples to show one’s might, it was bound to unleash wrath. It took several years for Arant and Seiðr of the American Black Metal band, BLACKEST, to fulfill their destiny with a debut album, following a few singles that were brought to the table earlier. 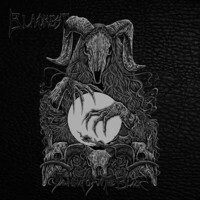 Signed to the underground local label, Blood And Brutality Records, the Alabama boys delivered their first message of utter blackness, “Dawning Of The Black”, to be set free, set to retain the grandeur of the past. In general, when listening to the old second wave flame of the early 90s, and even the sophistications that slowly erupted years after, it would seem that there isn’t too much to expect, yet with BLACKEST, things turned around into a thing of ingenuity. Though showing various of qualities that are one with the Scandinavian scene, it appears BLACKEST were able to develop a somewhat different direction, while not being mainly on the attack, blasting with blizzard fast paced tempos and thunderous riffing, the band accumulated a selection of Gothic and impressive harmonic elements in their paved traditional Black Metal music. Think about it as a founded mysticism, a warming sort of atmosphere, spread like belligerent wildfire among the tunes. I found it to be quite an exhilarating prospect. Nonetheless, I assume that the duo still needs to hone their approach within the blackened music, as at times their songs, with the dreariness shared, become a bit weary. Even so, this kind of outlook shown on this album is well reserved. Frankly, I was fascinated by the instrumentals more than the lyrical tunes. Not because that I didn’t like Seiðr’s vocals, quite the opposite, but mainly due to the fact that it these attained a strong edge and a great representation of the band’s abilities, more like Arant’s to be accurate. The epic “Remembrance” for instance, crossing more than ten minutes, is a remarkable piece. A set that seemed to be divided to several musical verses, without duplicating itself as it goes, just venturing between one section to the other. Certainly one of the better instrumentals in the Black Metal subgenre, especially from an underground band, that I listened to. I have gone through various cinematic driven tracks of other artists that set to reshape the music into originality, but this one is not the case. The magic of this gem was fulfilled through notable harmonies and conventional riffing that have always been there. The opening “The Dawning of the Black” was served as if being royalty, such a grandstanding intro for an album, truly a gratifying moment of glory. When it comes to the lyrical songs, I was astonished by “The Rise of Ashes”, which was the band’s latest single before the album’s release. Seiðr’s chants sounded more than merely the usual growl shriek pattern, those merged well with the atmospheric music, affirming the influence of the song’s lyrics. A good shift out of the known motifs and arrangement, letting the blast beating menace to calm a bit in order to warmly invite slow tempo fumes, nurturing a chaotic vibe that is virtually a blessing. I just found myself another band to follow. Stay tuned.